Air-Tel e-CRF® can adapt to your different needs. Thanks to a complete and multipurpose set of features, our E-Crf are your best solution for Electronic Clinical Data Capture in Clinical Studies, Registries and all type of other Clinical projects. 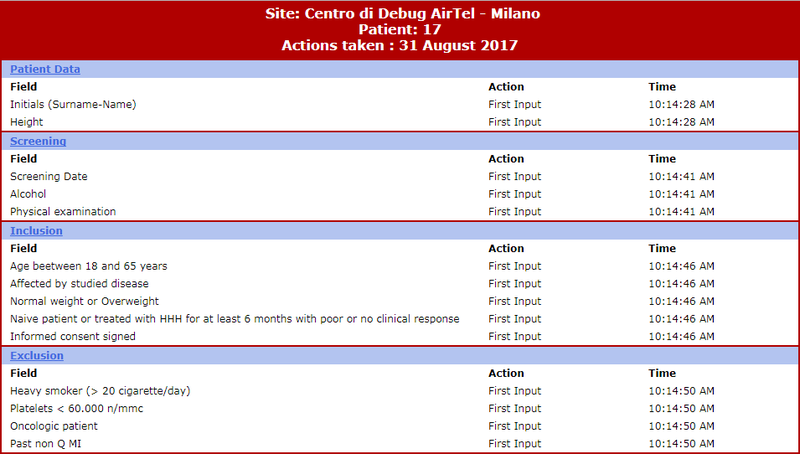 The Air-Tel e-CRF® have a very simple interface: the entry fields of the data are highlighted and ordered in intuitive lists. All previous data are encapsulated in the background and can be modified in GCP. Traceability is guaranteed. For data registration, pre-selected codes are used wherever possible (e.g. drop down menus, radio buttons to check) to minimize typing errors. The forms which make up the case report are always visible on the menu bar but can only be opened following a non-intrusive guided fill-in route. This procedure ensures that any data input finds an exact, unequivocal correspondence reducing the number of consistency checks necessary to 'clean' the database. 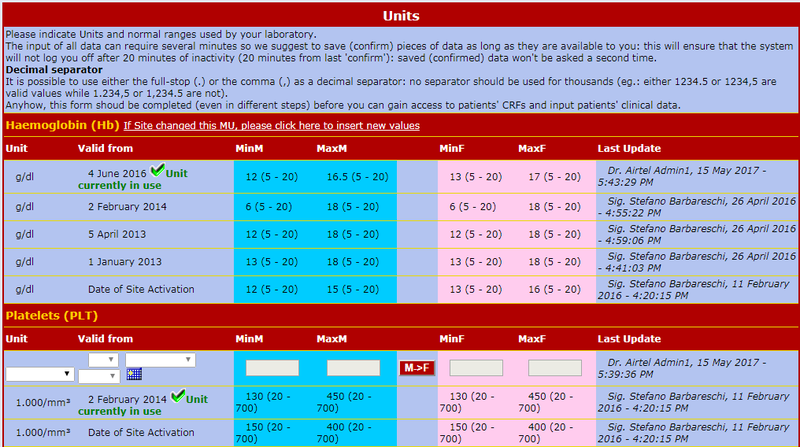 Each Center can use its own UMs (provided by the laboratory) and need to enter it just once. The internal conversion tables can standardize the data 'on-the-spot' and allow statistical analysis in real-time even if the source Data are expressed in different units. UMs can change over time. Air-Tel e-CRF® allow each Centre to change its UMs by specifying in which date interval the UMs are valid. Every update and modifications is tracked, in accordance with GCP. Thanks to the UM conversion processes, each piece of lab data entered is automatically compared with its range of plausible values. Major mistakes are rejected by the system immediately, thus reducing the need to make 'obvious corrections'. An optional feature of Air-Tel e-CRF® allows to detect in real time data that are inside the range of plausible values but outside the normality range of that Center. In this case the system automatically presents an additional question to the user, asking him to specify the reason of the "out of range" value thus fulfilling GCP requirements on this matter. The randomizing software is always available online and connected to each Air-Tel e-CRF®. When a patient is enrolled, the parameters collected during the screening process are used for the correct allocation, according to the protocol and by using minimization algorithms. 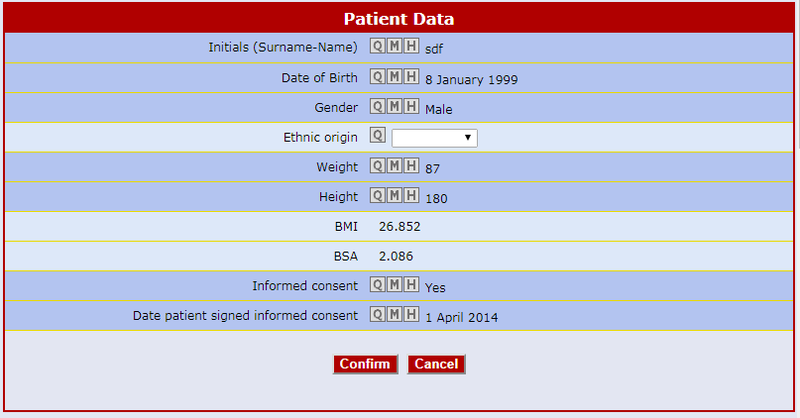 Detailed and complete descriptive statistic forms enable the user to navigate the database by objectives rather than by patient. There are windows related to recruitment, violations, safety, concomitant pathologies, therapies, etc. Other windows with "Ad hoc" unique statistics are created according to the needs of each clinical study. Air-Tel e-CRF® features an immediate and real-time geographical overview of all Sites partecipating to the study, including the number of patients. This features is particularly useful in multi-center international studies. Any data item can be queried by means of a single click. 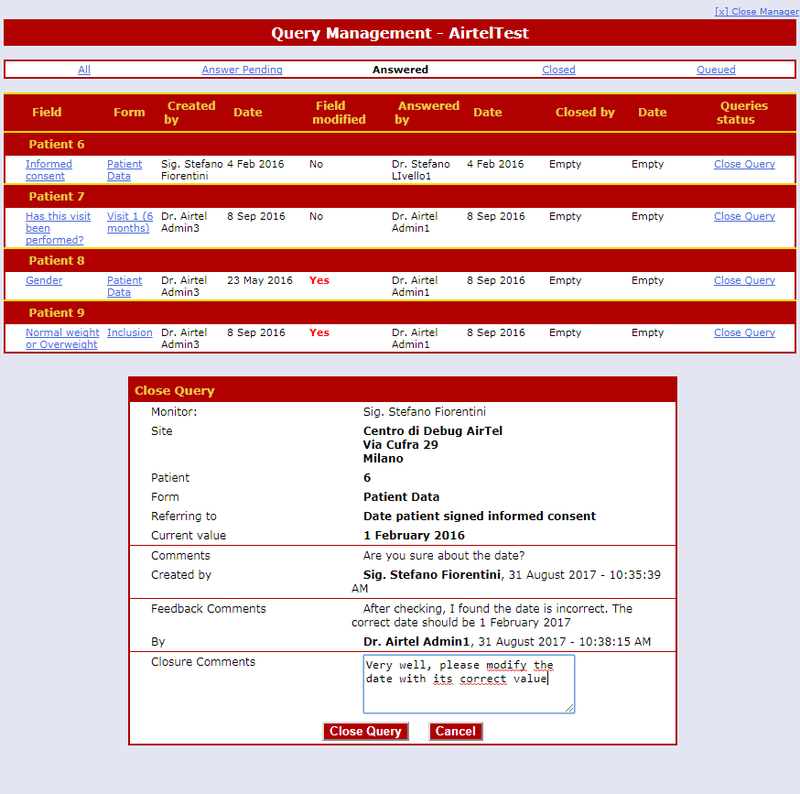 All queries are saved in the database and displayed both to the Clinicians and the Monitors. An optional and flexible email notification system is included. 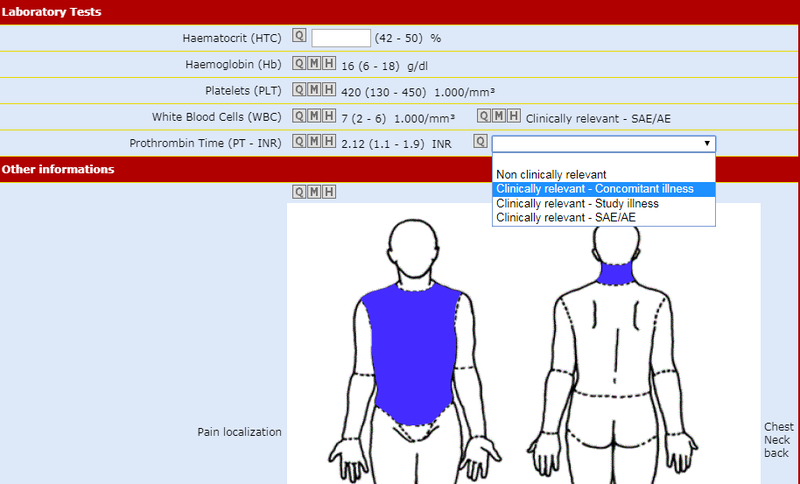 Queries are answered by the Clinicians and are then closed by the Monitor. For each Center most of the results of the previous functionalities are grouped and presented in summary tables. This enables the Monitor to be aware of the status, the validity and the coherence of the patients's e-CRF immediately and facilitate monitoring. 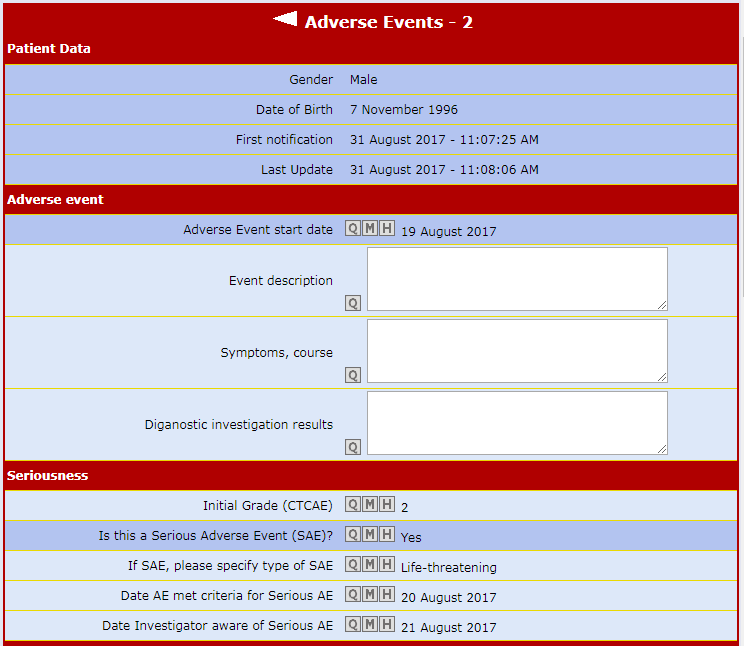 All notified adverse events are processed in real time. Reports and alerts are sent via email and/or text messages allowing full compliance with the pharmacovigilance laws in force. Through a validation process, the update and/or modification of each single data entry and/or form can be frozen by the monitoring staff to ensure the unalterability of the data up to that specific moment. All the clinical data can be exported, at any given time, in standard formats (access, excel, xml, csv) without service interruptions and can undergo standard protocol statistical analysis. With a simple click, you can switch languages (up to ten) at any time, without having to logoff and login again. Thanks to a Tracking Table all activities, input and amendments, are recorded and the complete history of the piece of data can be reconstructed. A second table records any change made to the database (removal of a form or an entire CRF). ...and many other awesome features we can't wait to show you!